An intensive choral workshop for choral conductors, choral music educators, and aspiring music educators. A conversation of school, religious, and community chorus conductors to explore solutions for promoting and preserving the choral arts today and for future generations. 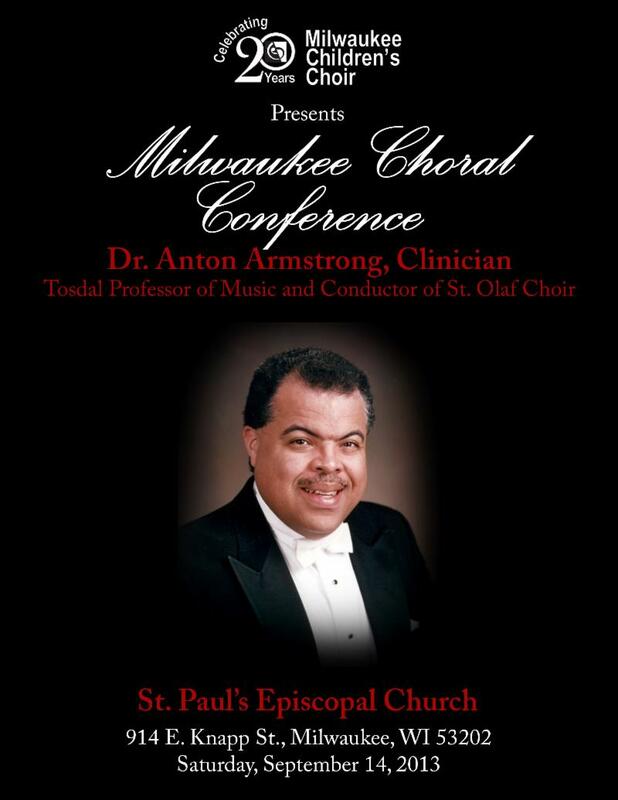 Registration for the 2013 Milwaukee Choral Conference includes: All conference sessions on September 14, 2013; refreshments during morning and afternoon breaks; lunch and dinner on September 14, 2013. Registrants may purchase, at cost, music used for the conference sessions. Packets will be available at registration. The specific price is not available at this time. Payment for the Milwaukee Choral Conference must be received in full by September 11, 2013. While pre-registration is preferred, registration and payment will be accepted at the door. Checks and money orders will be accepted. 158 North Broadway, Milwaukee, Wisconsin, 53202. Cancellation requests received on or before September 11, 2013 will be eligible for full refund less a $25 administrative fee. Cancellations after September 11, 2013 will not be eligible for a refund. FREE parking is available in the rear of the St. Paul's Episcopal Church. Should that parking lot be filled, you may park across the street in the rear parking lot of Lincoln Center of the Arts.